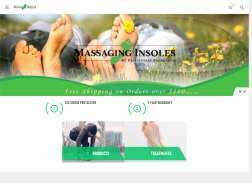 Massaging Insoles is a therapeutic technique, 100% glycerin filled insoles that provide cushion, increase circulation and massage your feet with every step. Absorbs shock, great for knees, hips and back. Massaging Insoles can help considerably in the reduction of pain due to heel spurs, stone bruises and pain. Get $10 Off Pair of Insoles.